So that catastrophic historical event that you learned about in grade school – where a volcano erupted and perfectly preserved an entire city under ash and stone for nearly 2000 years before being discovered? Yeah, it’s every bit as incredible as you might thing it is. This is Pompeii – the city that was buried beneath the destruction of Mount Vesuvius. We went there, and it was astounding. When we arrived in Naples one of the first things we did in the morning was to walk down to the water and view the bay. If you didn’t know the history behind Mount Vesuvius, you’d just be mildly impressed at the large dome-shaped mountain across from the city that clearly is missing a good third of it’s top. But when you know what it caused, standing there and thinking, that is Mount Vesuvius – wow – makes the experience that much more impactful. It also reminds you how long the land has been inhabited; by so many different people; and in so many ways that are important to the Western World. Pompeii is a short 45-minute train ride on the Circumvesuviano train that leaves from Naples’ central Garibaldi station. The ride isn’t particularly interesting; that is until you round the southern slope of Mount Vesuvius and see just how much of itself it blew into nothing. Like Mt St. Helens, Vesuvius was a significantly higher elevation before its most recent eruption in 79 AD. There were 2 things that struck me up arrival at the Pompeii Scavi station (which leads directly to the ruins): 1) I had imagined that Pompeii was further up the slope of Mount Vesuvius, but it’s actually quite low in the valley; 2) Pompeii was huge – not just some small town. Pompeii was a thriving city and its completeness in terms of how extensive the ruins are really is mind-boggling. Somehow Jon and I missed getting a map or any sort of guide to the city. This was both a blessing and a curse. A blessing in that we had no schedule for our visit – just an open curiosity that led us to many places where there were no tourists whatsoever. It was a curse in that we didn’t know what we were looking at at the time. It’s ok. I bought a book to read up later. When you walk into the main city square and approach the Temple of Jupiter, you have the first real understanding of the grandeur of the city and of its scope. Between Rome, Athens, visiting Greek Islands and many Roman ruins throughout France, Spain, England and Italy there is nothing that compares for me to the scale of Pompeii. It’s not tall and massive like the Colosseum. It’s simply that it’s an entire city, excavated, and completely accessible. 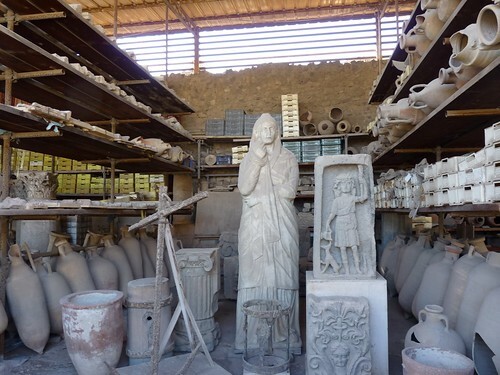 It really hits home what this place is when you come to a large storehouse of excavated pottery, in the midst of which are plaster-casts of the human shelled remains that were found at the site. Crouching, laid out, looking frightened – this is the only museum of sorts (except the Holocaust Museum in Washington DC) where I’ve felt such a human connection to the past. 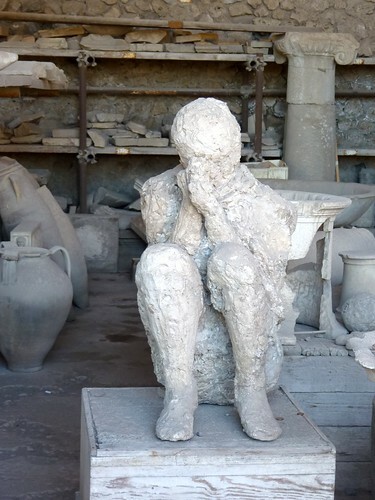 Even the fact that they are plaster casts (there is one case of actual remains to see, the rest are in the Archeological Museum in Naples), does not distract from understanding that fear and disaster completely transcend time and culture. One of the treasures of Pompeii upon its discovery was the mosaic and fresco artwork. Although much of the art has been moved to the Museum in Naples, there are still frescos and mosaics to view at Pompeii. Again, it’s one thing to see a fresco here and there at a ruin; it’s another to see it in the context of the vast city. You begin to understand the scale. I cannot imagine what the sight may have been like to discover homes, temples and taverns complete with furniture, tableware, art, sculpture and yes, the people, upon Pompeii’s discovery. Pompeii is special because you can walk down the original stone streets, see the grooves in the stone from cartwheels and look along the main thoroughfares and archways. Letting your mind fill in the missing columns and rooftops it’s easy to see Pompeii as a busy city center and commercial hub – all buried in one night. In terms of ‘attractions’ this visit was probably the best 11€ I’ve spent on the trip. We took about 5 hours to walk and explore and missed an entire quadrant of the city. If you go, bring food and water, and a keen curiosity to explore. This was a special treat for us, and I will always be grateful for seeing what is left of Pompeii.